Rabbit flesh is not in demand, despite claims by Whole Foods, so it remains a mystery why they are pushing so hard to try to create a demand that isn't there. Thankfully Sprouts, another similar grocery chain, ditched rabbit flesh after listening to its customers. Maybe Whole Foods can learn a thing or two from Sprouts. Whole Foods has a lot of clout, and if rabbit flesh takes a foothold in test markets, it could go mainstream, which doesn't sit well with the founders of Rabbit Advocacy Network or us here at IDA, as we encourage a vegan lifestyle to end as much animal suffering as possible. We don't want new animal species associated as "food animals" when we are trying already so hard to get all other species out of that category. Who's next for dinner at Whole Foods? Your dog? Your cat? As long as he or she is raised "humanely?" Please note; there is NOTHING humane about having your life end as you are hung upside down and you have your throat slit, whether you are a rabbit or any other animal. Please pledge to go vegan today. And tell Whole Foods to take rabbit flesh off the shelves. Sign an online petition here to John Mackey - Co-CEO, Whole Foods Market, Inc. It's not a happy anniversary for countless slaughtered rabbits, as we come up on the one year anniversary of Whole Foods pilot program offering rabbit flesh for human consumption. As more Americans eat less flesh, Whole Foods is actually actively trying to create a market for more various forms of animals to suffer for their meat cases — as in one of the top five animal companions: bunnies. The fifth largest grocery chain in the nation began offering rabbits as food last summer in select markets claiming a so-called demand for these popular family pets. While Whole Foods asserts it has high standards for animal welfare, it’s falling short and leaving many shoppers and animal welfare organizations questioning its so called humane ethics. According to an amazing NBC recent expose, the latest USDA findings are quite shocking. USDA inspection reports depicted rabbits in typical abhorrent factory farming conditions. 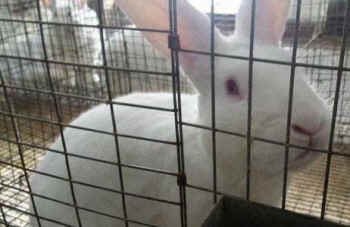 Rabbits were reported "dead on arrival" or "dead in the yard." In varying instances rabbits had no access to water. Rabbits as young as 8 to 10 weeks old died from stress or on the way to being slaughtered. Rabbit meat was also incorrectly "labeled as USDA inspected" when it was not, and the list goes on. More unsettling is that Whole Foods receives its rabbits from Iowa Rabbit in Iowa, one of six states with an "ag-gag" law making it a crime for anyone to take undercover photos or videos of what goes on behind closed doors. This makes it easy for factory farmers to get away with unspeakable horrors. The demand for rabbit is not strong and is in fact waning. We do not need another "meat" source, especially not from a companion animal, as rabbits are the no. 5 companion animal in US households. There is no reason to add another animal to your menu, especially one that millions of households consider a family pet. I ask you to take rabbit off the shelves, as one of millions of shoppers who appreciate your variety of vegetarian and vegan options in addition to your product offerings that do not test on animals, including rabbits. Sprouts listened to its customers and took rabbit meat off the shelves. Please follow their lead or I will take my business to Sprouts.